Originally uploaded by Dawn Endico. 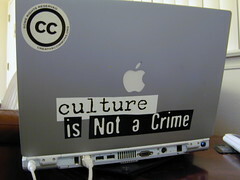 I attended a lecture by Larry Lessig on Creative Commons on Friday afternoon. Many of you have probably seen Larry’s stump speech and the remixes in it are simply amazing. So I woke up this morning with an urge to remix something myself. And the perfect tool is a new service called JamGlue. JamGlue is in closed beta, but I saw the company at the Ycombinator event in Boston in August and they gave me access to it. Jamglue is like the CCmixter service that Creative Commons developed, but I think its easier to use and has the potential to be a lot more popular. I took a live recording of The Flaming Lips singing You Have To Be Joking from the show Jackson and I went to last Sunday and added some choice George Bush bloopers into it. I call it I Wish It Was A Joke.